Enhance The Look of Your Party & Serve Your Guests With This Set of Elegant & Stylish Paper Dinnerware Set! Are you planning on throwing a party but need to stock up on some dinnerware for guests? Tired of dealing with the clean-up that follows a party? Are you looking for something that's both affordable and will get the job done? If yes, then this Disposable Serving Plates, Disposable Deserts Plates and Disposable Cups set is exactly what you're looking for! The Perfect Blend of Quality & Style! 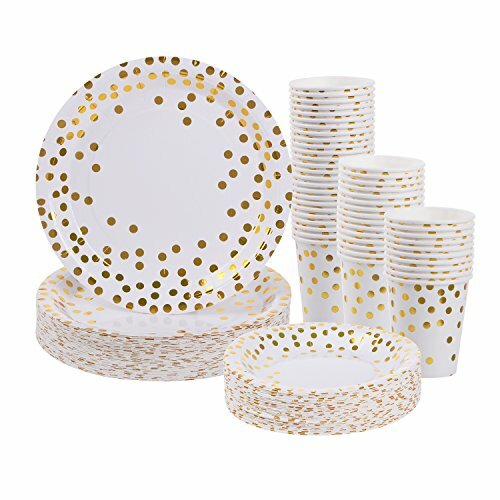 Made of thick paper that gives our disposable plates extra durability, these elegant gold dot party pack has all the dinnerware you can need to serve up to 50 guests making sure you're always ready to throw a party! Quality Is always our top priority but that doesn't mean we don't focus on making our party plates look elegant. This bulk party plate set includes plates and cups that go perfectly with the décor of any event making them perfect to use for almost any occasion. No More Time-Consuming Party Cleanups! With these disposable dinner plates you save yourself hours clean-up time by throwing them out after use, while still enjoying the elegant accent they add to the décor of your event or party! This Is The Disposable Dinnerware Set You Need! ✓ Perfect choice for weddings, birthdays, office parties, bridal showers and more! Order Today To Save Time And Money On Your Next Party! ✓ SUPERIOR QUALITY AND STYLISH DESIGN: Made using thick and high-quality paper, these party plates and disposable cups are designed to not fold, tear or break when holding food while the stylish design keeps things fun! With these bulk paper plates, you can focus on having fun and keep coming back for seconds and thirds without having to use a new plate every time! ✓ EFFORTLESS CLEANUP: No one likes having to deal with the cleanup that follows a party which is why we designed this Disposable Paper Plates and Cups Set! Thanks to the recyclable and eco-friendly paper we use, you can simply throw these out when used making cleaning up after an event or party a breeze. These party supplies are the perfect solution for elegant yet convenient dining at any party or event! ✓ PERFECT FOR EVERY OCCASION: This set of heavy duty party paper plates and disposable cups is the perfect choice for almost any occasion. With a high quality and gorgeous golden shimmer, these disposable dessert plates and party dinner plates are perfect for holidays, birthdays, engagement party, anniversaries, baby shower, bridal shower, bachelorette party, graduation and get-togethers. ✓ 100% RISK-FREE PURCHASE: At Fegodi Party Supplies, we believe in providing our customers with high-quality products that are both affordable and look fabulous. From using high-quality material to ensuring our party supplies look stunning at any kind of party, we take all the right steps to make sure you get the best. Each purchase is backed by our 100% Customer Satisfaction Warranty so that you know your investment is risk-free. If you have any questions about this product by Fegodi, contact us by completing and submitting the form below. If you are looking for a specif part number, please include it with your message.